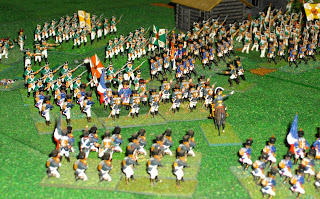 The ANF had it's third 'meeting', and second battle with the Shako rules, on Sunday 10th October 2010. 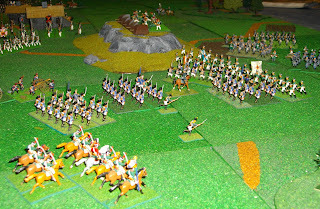 This time we did a re-fight of a battle based on Utitsa 1812 (the southern sector of Borodino). It was a tense, see-sawing encounter until the last couple of turns, but ended being a clear Russian victory. Poniatowski's (aka me) Polish corps was faced with the challenge of taking the heavily defended Utitsa mound and town (photo above). The plan was to avoid the mound and send a pinning attack against the town while attacking around the Russian left flank with an infantry and cavalry division (photo below). After six turns it looked as though the flanking attack would break through (second photo below), but the two Russian regular battalions in an otherwise mlitiia division were able to repulse the attacks of the Polish infantry (heavily disguised as French) that had been weakened by Russian artillery fire from the mound. Meanwhile, on the Russian right, reinforcements on both sides had been thrown into the attack (French) and defence (Russian) of the area around Utitsa (photo below). 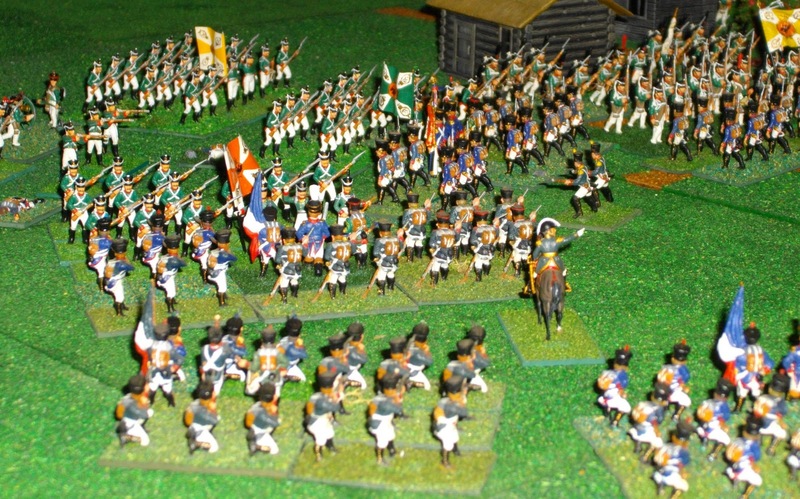 Having had two divisions leave the field Poniatowski launched a final, desperate attack with the fresh Westphalian troops aimed at breaking the Russian grenadier division around Utitsa. This failed and the battle was over (last photo below). In the end it was a well-deserved Russian victory. 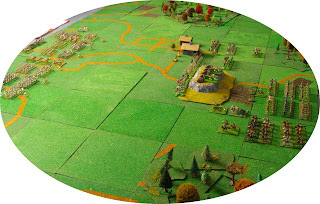 This scenario came from Chris Leach's Fields of Glory. Of Course it was a Russian Victory. Otherwise you would have written this blog in French.